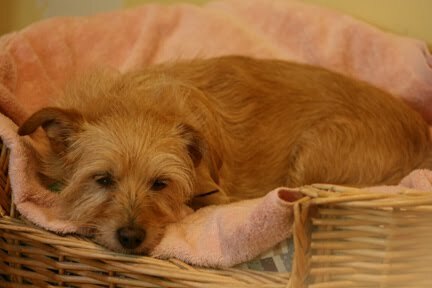 Our dear little dog Zoe had to have an operation today. She had developed a lump on her belly and it has doubled its size in the past month. So today was her appointment to go visit the lovely (expensive) vet and have the lump removed. The lump has now been sent to pathology to check if it is benign or malignant. I am being positive and I know it will be benign and all will be OK. While she was out they also gave her teeth a good clean and did a few blood tests. She is now sitting in her bed with her Tasmanian Devil Teddy feeling sorry for herself. She is normally such an active little dog it is weird seeing her just lay there. Oh well give her a couple of days and her barking will be driving us crazy again. On a totally different and wonderful note, I would like to congratulate lovely Darlene of “My Life for a Year” on the birth of her new little granddaughter Elyssa. Welcoming a new little person into our world is such a wonderful, heartwarming thing to experience. Darlene may you and Elyssa share many many happy times together. “Davine Time” update: Tonight I am going to a candle party and my friend Alice’s. Yeah another fun night spent with some of my amazing friends. There are so many vet ka chings there, I can't even begin to guess. Yes Andrew it certainly wasn't cheap!!!! The cat of a friend of mine has been at the vet three times this week because there is black stuff growing around her claws. A vet dermatologist ... ka ching! Awww poor puppy but as you mentioned Davine, I'm sure that he's going to be up and running around again in no time at all. A speedy recovery to your puppy. Thank you very much Davine, I feel so blessed and honored to have this sweet little princess in our family now. She's such a little doll. What's sweeter is seeing my son in the father roll, he's so good at it already and I'm extremely impressed! Have a wonderful weekend my friend, hugs sent your way from across the miles. Hope Zoe recovers well! Not a lovely prospect with a vets bill, they charge way too much! Enjoy the candle party!